Paul Rudd and Evangeline Lilly return in the 20th Marvel Cinematic Universe movie Ant-Man And The Wasp. In this outing, The Wasp (played by Evangeline Lilly) and her father Dr. Hank Pym (Michael Douglas) are in search of Janet Van Dyne (the original Wasp portrayed by Michelle Pfeiffer), their mother/wife. Their search began anew when Scott Lang (Ant-Man) returned from the Quantum Realm, a feat thought impossible. Janet had been trapped in the Quantum Realm for 30 years. They now had the hope she could be alive. During their search, they run across new threats including a black market arms dealer named Sonny Burch (Walton Goggins) and Ghost/Ava Starr (Hannah John-Kamen). These threats hamper their rescue efforts and create fun action scenes you’ll love to watch. But there’s more to Ant-Man And The Wasp than these scenes. There are leadership lessons in Ant-Man And The Wasp you’ll not want to miss. 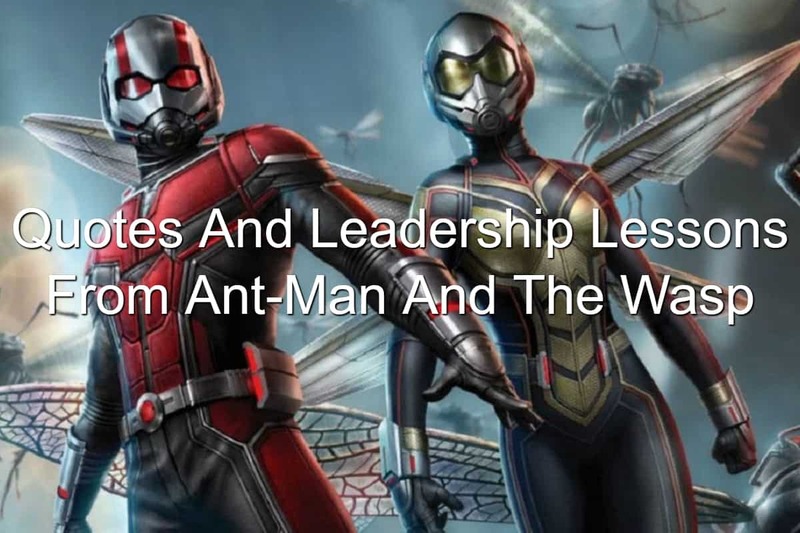 So, let’s check out the leadership lessons you can find in Ant-Man And The Wasp in the latest Reel Leadership article. I started to wonder if your mother is still alive. In the original Ant-Man movie, we learn Hank Pym and Janet Van Dyke were the original Ant-Man and the Wasp. They were a formidable superhero team. Yet they ran into trouble and Janet shrunk to an infinitesimal size and was lost in the Quantum Realm. All hope was lost. Or so Hank thought until the new Ant-Man, Scott Lang, returned from the Quantum Realm. This renewed his hope of being reunited with his wife and put a new passion in his heart. Leadership starts with a passion. There has to be a spark to create the desire to lead. Do you remember that spark? That creative wonder that made you think you could lead? You need to recapture this wonder. Capture the beginning hope of a better organization or a better way of doing things. When you have a reason for leading, you’re going to lead better. Scott Lang had been on house arrest because he had broken the law. The Sokovia Accords didn’t allow superheroes to use their powers. He had when he fought the Avengers in Captain America: Civil War. This meant Scott had a lot of free time on his hands. During his house arrest, Scott began to study magic tricks. He eventually was able to pull off some pretty fun and amazing close-up magic tricks. They were so good people begin to ask him how he was able to do them. These people included FBI agent James “Jimmy” Woo (Randall Park) and other cast members. Their questions about how he was able to pull off these magic tricks were humorous moments but they showed something else. People are inspired and awed by talent and skill. Great leaders are skilled in what they do. Their talents and abilities impress those around them. Not because they want to be admired but because their skill is awe-worthy. Hone your craft. Make sure you’re doing the best work you can. And then do the work only you can do. Scott wanted to take a bath. However, he had an ankle bracelet tracking his every move due to his house arrest. To take a bath, Scott had to wrap his ankle bracelet in a baggie and then enter into the bathtub. Once Scott was in the bathtub, he began to relax. Then something happened. He began to hallucinate or flashback to his time in the Quantum Realm. There, he saw Janet Van Dyne. His experience in the Quantum Realm stayed with him. It was a part of who he was and who he was becoming. Your past is your past. Still, your past is also a part of you. You cannot escape your past. My suggestion to you is to embrace your past. It’ll provide you with the experience you’ve already gained and open new doors for you. Because of his actions in Captain America: Civil War, Scott was on house arrest. He was being punished for what he had done. Still, his punishment was only the beginning. Dr. Hank Pym and Hope Van Dyne had provided Scott the technology for Ant-Man. Their technology was used in an illegal manner and they were now in hiding because of Scott’s actions. His actions had repercussions on people who were not directly involved in what he had done. You have to be aware of your actions and the impact they may have on others. Yes, you’re going to have to face the consequences of your actions. And others may as well. When you make your choices, think of who else may be impacted by your actions. Are you willing to have them pay the price for your choices? Hope Van Dyne met with the arms dealer Sonny Burch in an attempt to get a piece of technology that would help her and her father go to the Quantum Realm. When Hope arrived, Sonny changed the deal. He told Hope he had a buyer for their technology. The buyer had offered $1 billion. This is a lot of money to anyone, let alone two people running from the law. Yet Hope turned down the buyer’s offer. She had a good reason too. She was out to save her mother. And saving her mother was more important than money. Leaders can get mixed up at times while leading. They’ll see dollar signs flash and begin chasing the money. You’re better than that though. You know leadership isn’t about the money you will earn. Leadership is about the lives you can change and the lives you can touch. This is what leadership is about. Guiding, showing, changing lives. Ghost made her appearance after Hope turned down Sonny’s offer for the technology. In the fight that ensued, Scott was ready to jump into action. One problem: Scott didn’t have the Ant-Man suit. Hank did have something for Scott. Hank had a prototype suit that Scott could use. Only it wasn’t a fully-tested suit. The suit was still a prototype. This didn’t stop Scott from donning the new Ant-Man suit and going in to help. He knew what needed to be done. Our work is constantly a work in progress. From changing deadlines to tweaks in the plan, you may never see the completely finished product and have to run with the prototype. You’ll be okay. You can still get by with an unfinished work. Luis (Michael Pena) was Scott’s business partner in their new business X-Con Security Consultants. Two other employees were at the business when Luis noticed something. There were fancy pastries being eaten. These pastries cost more than the oatmeal he’d okayed on the budget. This caused Luis to go into a fit. He ranted and raged about the budget and how they needed to stay focused on the money side of the business. The employees had another opinion. They needed to be fed and fed well. And the pastries didn’t cost much more than the oatmeal. The pastries made them feel better and they were willing to work harder. Focusing on the budget is important for the business. You have to make a profit and you have to make sure bills are paid. Yet you can’t ignore the fact you need to take care of your people and purchase the proper tools to get the job done. When you’re so focused on the budget, you begin to become pennywise and pound foolish. You will cut corners where there’s no room to cut or get inferior products which will cost more in time and labor than if you would have purchased high-quality tools. Know when to be budget-wise. Know when to spend more. It’ll pay back more in the long run. You seem to have a lot of falling outs with people. Throughout the movie, you begin to hear of the people Hank Pym has upset or fallen out of favor with. There were Elihas Starr (Michael Cerveris) and Dr. Bill Foster (Laurence Fishburne). Colleagues, friends, family… All people Hank pushed away or upset. Luis called Hank on this. He noticed all the problems he had and how there was one person involved in all of them: Hank. When you begin to notice a trend, pay attention. Especially when the trend involves people and broken relationships. You play a big role in the way your relationships will go. Look at the situation. Are there more broken personal and business relationships left in your wake than whole, productive relationships? The problem might be you. The good news is once you recognize the problem, you can begin working on yourself and restoring those relationships. Viewers of Ant-Man And The Wasp learn the sad tale of Ava who becomes Ghost. Her father, Elihas Starr, was discredited by Hank Pym. So he began working feverishly to find a way to the Quantum Realm. His work led him to take more and more risks. Eventually, something bad happened. Elihas and his wife died in an explosion. Ava was transformed into Ghost. The risks Elihas took were too great… Too many… And people paid the price. What risks are you taking? Are the risks calculated? Are they measured? When taking risks, you have to be careful. You have to weigh whether or not the outcome outweighs the consequences. Cassie (Abby Ryder Fortson) was Scott’s daughter. While Scott was held captive by Foster and Ava, Cassie sent a 911 text. Do you remember those? They were sent to signal an emergency. Scott made his case to allow a response. Foster eventually relented. When Scott talked to Cassie, he discovered her emergency wasn’t an emergency after all. She’d left her soccer shoes at the house and needed them. You will have team members coming to you with emergencies. These are tasks or problems they believe are a pressing concern. Yet when you dig into the issue, you soon discover they’re not a true emergency. Be careful of letting other people’s emergencies become yours. While they may be important to the person, it doesn’t mean their emergency should become your problem. Scott, Hank, and Hope were able to escape from Foster and Ava. This is when Ava comes up with a diabolical plan. She wants to kidnap Scott’s daughter. Her line of thinking was Scott would do anything for his daughter. He probably would. He might have even gone all Liam Neeson on her. Foster knew this wasn’t a good idea. Messing with another person’s child never ends well. So he persuaded Ava to leave Cassie alone. 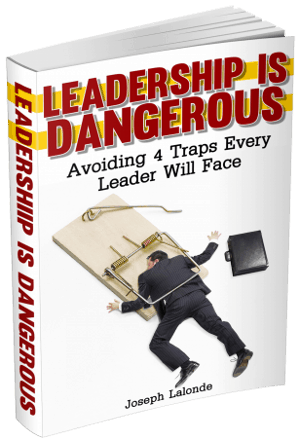 You may be tempted to do unethical things while in a position of leadership. You might be offered illegal kickbacks to give a job priority. Or you might be tempted to skim money from the petty cash account. These are lines you should never cross. You can’t be an ethical leader while doing unethical things. Know your lines. Don’t cross them. Hank and Hope were so close to entering the Quantum Realm but they were still having trouble. They went back to the computer to work when Scott pushed them aside and began typing away. Hope and Hank tried to push Scott away. Only to realize it was Scott’s body but Scott wasn’t in control. Janet had taken control of Scott and was finishing Hank and Hope’s work. She had a connection with Scott because of his time in the Quantum Realm. And she could see the work that needed to be completed. While Hank and Hope had done great work, there was a little more that needed to be done. Their work needed a nudge. You do great work. You know this. So does your team. But you’re not an island. Neither is your work. When you’re working on a big project, get the input from others on your team. Ask them what they see or don’t see. Seek advice on what improvements could be added or what could be subtracted. A little nudge from an outside perspective could move your project from good to wow. Trying to help people isn’t dumb. Ahhh, what wise words of wisdom from a child. Cassie knew something most adults have forgotten. Helping people is never dumb. Have you forgotten this truth? Have you failed to help the ones you can? Look for ways to help others. Whether these people are strangers or the ones you lead, you can help others. And it’s never dumb. The new Ant-Man suit had a few glitches. It was a prototype after all. One of the glitches was it would randomly shrink or enlarge Scott. Thankfully, the suit made Scott grow when he was trying to stop a runaway truck. He was able to get in front of the vehicle and dig his feet into the ground. The vehicle still pushed him forward. But he was making progress in slowing down the vehicle. All the while, this was happening in front of a coffee shop. There were people inside glued to their laptop screens or sipping their cups of coffee. These people were oblivious to the event happening in front of them. Your work is important. I’m not taking anything away from it. However, you have to be willing to look up and see what’s happening around you. Your little daughter is becoming a young woman. The church you’re attending is helping the poor and the widows. A friend is grieving the loss of their spouse. Life is going on in front of you. Are you paying attention? Don’t let technology or work blind you from the awe-inspiring or the important. You need to come up for air and breathe in life. Scott’s suit wouldn’t let him decrease to his normal size. He was still giant. This became a problem as he began to chase down Sonny. Sonny went through a metal gate. Scott attempted to follow. He couldn’t because he couldn’t fit through the gate. His size became a problem. He was too big. You want to grow your organization to the next level. You want to see the company grow and thrive. But could growing cause a problem? These are things you have to think about as you grow and build your organizations. What limitations does size bring? Could you serve people better by staying small? Think on these things. Then make a choice. Ava had told Foster to leave her. He needed to get out of there and take care of himself. Foster chose to stay. He wouldn’t leave his surrogate daughter. She needed him and he would be there for her. Leaders stick by their people. They choose to stay when others would run. Be a leader who stays. Question: Have you seen Ant-Man And The Wasp? If so, what leadership lessons from Ant-Man And The Wasp did you discover? If you haven’t, what leadership lessons from Ant-Man And The Wasp that I shared resonated with you? Let me know in the comment section below.